“And I also want you to organize varnasrama society [the Vedic social structure]. Divide society: brahmana [intellectual class], ksatriya [administrators], and so on. There should be social division, just as there is a division of the different parts of our body. This will help people. Don’t waste the human form of life by sinful living. I have already given the ideas in my books, so you should all read them. You are intelligent, all of you. Caitanya Mahaprabhu said para-upakara—do good to others, do not exploit them. Any human being has the ability to chant Hare Krsna. Give them chanting. And also make the situation favorable. Is that clear? “Printing of spiritual books is our life-force. Print more books. This material body is only bones. But go on printing—this is life. We are not concerned with bones and stones. Our concern is the living force: apareyam itas tv anyam prakrtim viddhi me param. The living force is sustaining these bones. In the material world, people are all simply protecting bones and flesh; they have no [spiritual] idea. “Take matter—you mix earth, water, put it into fire, and then make a building. But matter cannot act automatically. Matter cannot have mind or consciousness or impetus. It is nonsense to say that matter gives rise to life. Matter has no sense. Life is the superior energy; matter is useless. Bhumir apo ‘nalo vayuh [the material elements] are useless. But there is another, superior nature. Yayedam dharyate jagat And that nature is actually governing the whole, universe. When asked who would succeed him as the leader of the Krsna consciousness movement, Srila Prabhupada replied: “All of my disciples will take the legacy. If you want, you can also take it. Sacrifice everything. I—one—may soon pass away. But they are hundreds, and this movement will increase. It’s not that I’ll give an order: ‘Here is the next leader.’ Anyone who follows the previous leadership is a leader. I don’t make any distinction between Indian and European. All my disciples are leaders… as much as they follow purely. If you want to follow, then you can also lead. But you dont want to follow. ‘Leader’ means (one who is a first-class disciple. Evam parampara-praptam. One who is perfectly following. Our instruction is, guru mukha-padma-vakya. Do you know this? Ara na kariha mane asa. [My only desire is to have my consciousness purified by the words emanating from the lotus mouth of my spiritual master’]. To become a leader is not very difficult, provided one is prepared to follow the instructions of the bonafide guru. 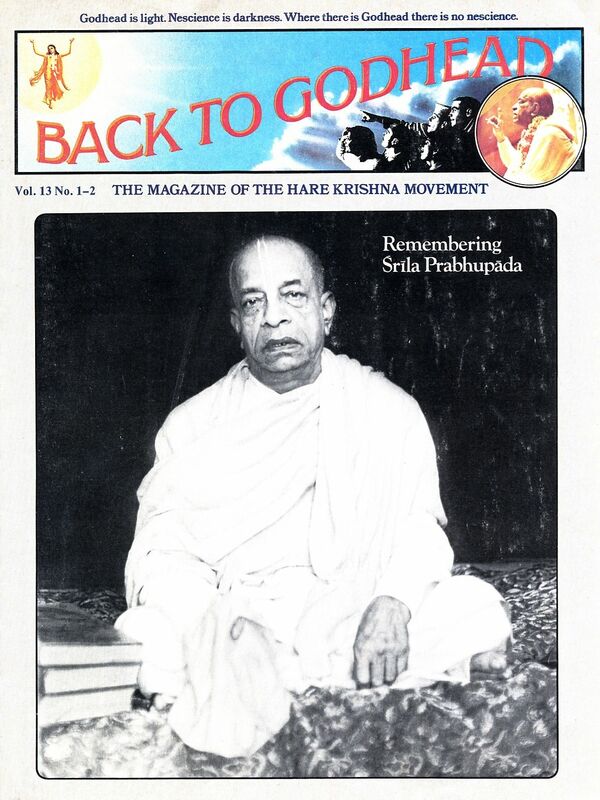 This entry was posted in A. C. Bhaktivedanta Swami Prabhupada, Back to Godhead Magizine and tagged A. C. Bhaktivedanta Swami Prabhupada, Back to Godhead Magazine, final instructions, Srila Prabhupada, Srila Prabhupada speaks out. Bookmark the permalink.